Cult Labs - View Single Post - Laurel And Hardy - Good, clean, classic comedy! Thread: Laurel And Hardy - Good, clean, classic comedy! “Well, here’s another nice mess you’ve gotten me into!” Enter Laurel & Hardy’s unique world of emblematic bowler hats and highly visual slapstick with this special compilation boxset of the very best Laurel & Hardy feature-length films. 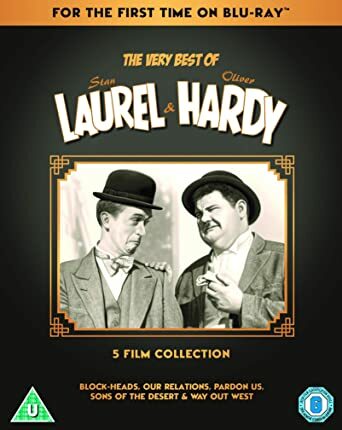 With Laurel playing the clumsy and childlike friend of the pompous bully Hardy, the misadventures of the most recognizable comedy double act, whose charm and on screen chemistry set a new standard, are perfectly captured here in high definition for the first time. Includes Block-Heads, Our Relations, Pardon Us, Sons of the Desert and Way Out West. Includes bonus: Another Fine Mess, Busy Bodies & Towed In A Hole"